The Philippines is known for celebrating the longest Christmas season in the world. That is why Kraft Eden Philippines launched the Keso de Gallo in search of the best 100 unique dishes in 100 towns for 100 days. Filipinos start to celebrate the Christmas season 100 days earlier. Last year, Kraft Eden gave the celebration of Misa de Gallo a cheesy twist by feeding churchgoers for 9 mornings in 9 different cities from Luzon, Visayas and Mindanao, in 9 different churches with 9 carefully selected Filipino recipes. But this year, they aimed to invite a hundred because during this season of merrymaking – the more really is merrier. 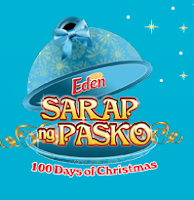 Now with 100 towns competing to have the country’s number one dish, Eden’s 100 Sarap ng Pasko: 100 Days of Christmas will bring out even more the culinary creativity in every participating town nationwide, to strengthen the Yuletide spirit alive for each Filipino across the world. With a natural love and passion for food, this pioneering celebration isn’t merely a competition. Moreover, it brings the entire nation together in time to share the tastiest of Yuletide tidings. “Christmastime is a time wherein sharing is found most prominent especially among families,” Senior Brand Manager Anna Sapitan discusses. “Through this, we wanted to unite the country together as one big family with a common love for Christmas feasting.” As a country that is known to be naturally warm and generous, Kraft Eden also aims to share Christmas joy and faith to every Filipino across the nation. With the Spirit of Christmas ignited as early as September 4, 2010 and kept alive until the first Sunday of January 2011, the country is sure to make a mark in Christmas history the world-around. Moreover, the Yuletide warmth and joy spread by the country’s well-loved cheese among Filipino families nationwide will empower and unite the country even more. Vote for your town and help them realize their simple community wish by winning 2M in support fund and 100,000 for yourself. Send an Eden carton and be counted.View the complete mechanics here. Visit www.sarapngpasko.com or call 72-PASKO for more details. 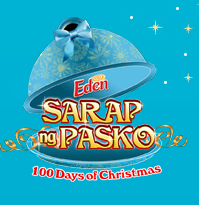 Theme Song: "Sarap ng Pasko Dahil sa Eden"
100 towns. 100 days. 100 unique dishes. 1 Grand Yuletide celebration.